I ran into my friend Bruce Roe on the ferry yesterday. 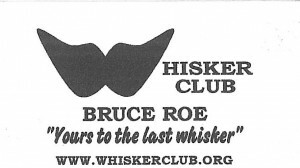 Bruce, head of our own Whisker Club and the guy who brought the World Beard and Mustache Championship to Bremerton last summer, has a part-time job ushering at SafeCo Field and was on his way to the Mariners’ Father’s Day matinee. And, from what he told me, even in his work get-up he stands out to some. The Arizona Diamondbacks were playing the M’s this weekend, and before Friday night’s series opener Roe was going about his business on the 100 level. Six Diamondbacks warming up along the first base line saw him, and started yelling to get his attention. Why all the interest in an usher? The guys wanted Bruce to meet their teammate, Clay Zavada. Zavada is a relief pitcher for the D-Backs. He’s also, style-wise, the heir apparent to Rollie Fingers. Bruce walked down to the field, tickled at the young major leaguer’s interest in the mustache arts. He gave Zavada a Whisker Club business card, and a standing invitation to join the Bremerton branch for a meeting at the Airport Diner. But he may want to wait to offering any sort of spokesman gig to the young right-hander — Zavada gave up an 8th inning run to the M’s and took the loss Sunday. I’ve said it before, and I’ll say it again: If there can be both a Stitch ‘n’ Pitch Night (August 27th) and an I Can Has Cheezburger Night (July 9th) at Safeco, there can definitely be a Beard and Mustache Night. You mean Bobby Ayala Goatee Night at the Kingdome, June 28, 1995? 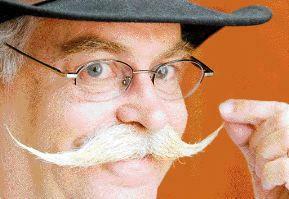 It’s so not worth bringing the walking blown save back to town, even in the name of promoting facial hair. Aw, I just spend upwards of 30 minutes looking for a Mariners commercial that I thought existed…where the whole bullpen starts wearing goatees. No luck. The Edgar ones were great, though. Ah, the good ol’ days.